Have you found the perfect recipe for pancakes? If not, try Malted Milk Powder Pancakes. The malted milk powder makes them light and adds a little malty flavor and a touch of sweetness. You can cut the recipe in half if you want a small batch, but an even better option is to make all the pancakes, stack them between parchment and freeze them. 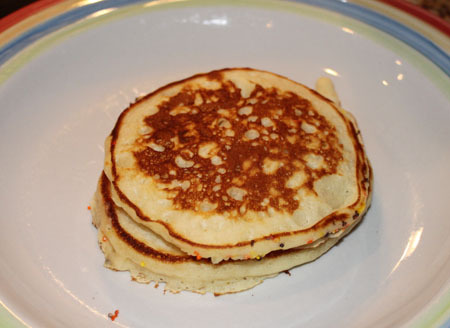 The night before, put the pancakes in the refrigerator too thaw, then just warm them in the microwave for a few seconds. 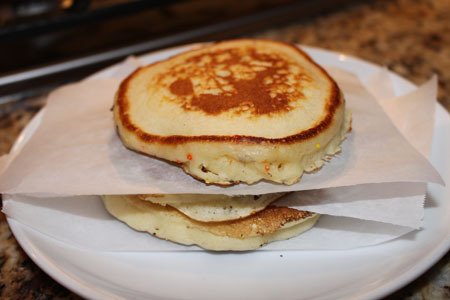 Here’s a link to the recipe — King Arthur Flour’s Simply Perfect Pancakes. More than 80 people have given the recipes a big thumbs up, so if that’s not enough to buy some malted milk powder, well I don’t know what is. Oh, wait. I do. How about 8 more good recipes that call for malted milk powder. Thanks for sharing this! It looks great and I will be trying it soon!! My dad LOVES malt. And Cooks Illustrated just recently printed a recipe for the best cupcakes and they have a version with malted chocolate icing. I can’t wait to try these. I had to show off my pancakes before I could link you to King Arthur! I used the recipe from their site without making any modifications, so rather than post the recipe I’ve posted a link to theirs: ). 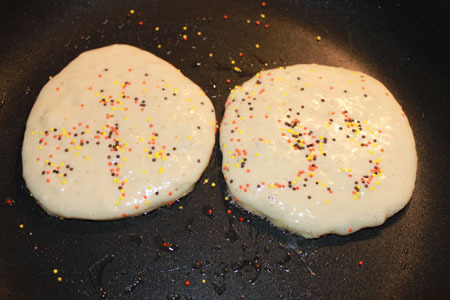 The link is right under the pancake photo, but I’ll email it to you. Am I missing seeing something? I clicked on the “Get the Recipe” button and was immediately whisked to a description of your wonderful looking pancakes as well as the titles of other goodies utilizing the malted milk powder, but no pancake recipe! Is that the trick instead of a treat? Oh, but after my local Walmart remodeled they stopped carrying malted milk powder! I had to go to Kroger’s to get it. I’ll have to try this I would never have thought to add it to pancakes, either. But I usually keep malted milk powder on hand for a malted milk chocolate cookie recipe (from cooking light) that my kids really like. I’ll have to tell Denis. He’s the pancake man on the weekends. I just bought a new container of Malted Ovaltine too. One of the things he does that is uber decadent is to put some m and ms in the pancakes. It really is like a dessert! Jamie calls them “Buried Treasure Pancakes”. I think his dad has a sweeter tooth than him though! Stores usually sell it in the hot chocolate/cocoa/coffee aisle. Some stores keep it with the ice cream toppings. pancakes are my favourite things in the whole world! homemade only! i’m heading out now to look for malted milk powder! Those look delicious! Problem is I have never seen malted milk powder for sale before… where do you buy it? I know four little boys who just might like these–especially the added sprinkles! Sprinkles definitely do make everything taste better. 🙂 I love the sound of these. I have malted milk powder and will try these soon. Thanks! I love that you add sprinkles! If you ask my kids sprinkles make EVERYTHING better. I will have to try adding some to my next batch of pancakes! Some days I’d like to give you a hug. This is one of them. The pancake recipe is a real find, but putting all of those other malted milk recipes in one place was an inspired idea! We have a pancake recipe that we love and that my kids grew up with. My family might wonder about me if I spring a new pancake recipe on them, but they might be pleasantly surprised! SO funny you should post this! I was just barely showing the kids our stash of malted milk powder from my last visit to the states and told them they could use it in their milk (it was purchased for use in baking and the occasional chocolate shake). The only recipe that I love and make with it is the chocolate malted sandwich cookies you have posted before (from Martha Stewart). I haven’t loved most other recipes that call for it, but I’m excited to try some of these, but especially the pancakes! So I think I know what we’ll be having for breakfast tomorrow!! And I love refrigerating or freezing pancakes and popping them in the toaster in the morning for a fast home-made breakfast! (we don’t have a microwave and I love having he outside getting a little crispy with toasting). Thanks! I’ll come back and say what we thought about them after we try them out. Thanks for finding me :). If you have any questions or special recipe requests, feel free to email me. Newbie to your blog and I’m lovin’ it! Never thought to add malted milk to pancakes – will purchase some today. I’m downloading your recipes like crazy!! Thanks.